It's no secret there's a portion of Nintendo fans who absolutely adore Waluigi. We've seen petitions for the purple Mario character to be included as a playable fighter in Super Smash Bros. Ultimate and the Nintendo of America boss Reggie Fils-Aimé has even gone on record saying how the series' creator Masahiro Sakurai is well-aware players want to play as the mischievous character. 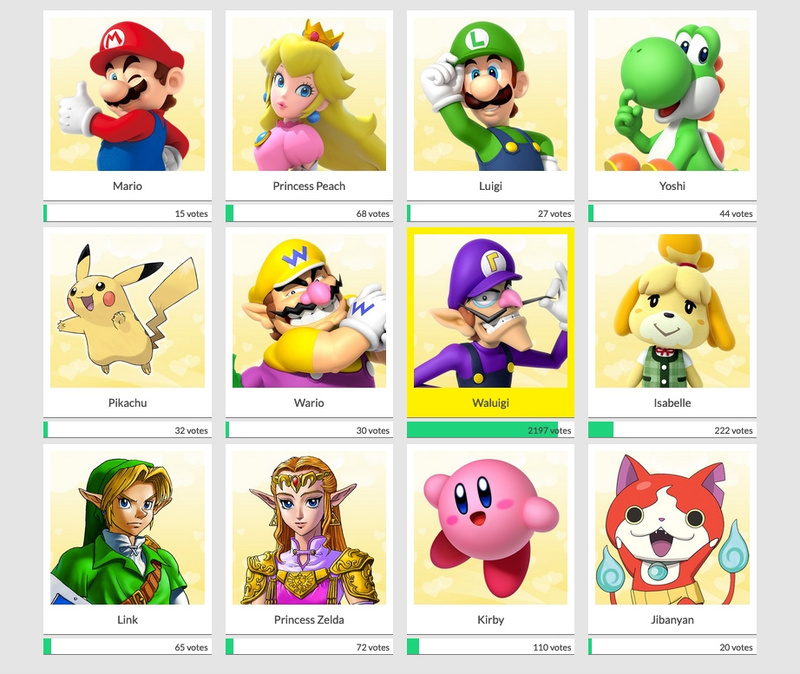 As can be seen, Waluigi absolutely smashed the competition, with a whopping 2197 votes. That's ten times the amount of votes Isabelle received in second place. Mario had just 15 votes and Jibanyan from the Yo-Kai Watch series wasn't much better with 20 votes. Wario only had 30 and Luigi received a total of 27 votes. Would you give Waluigi a token of love on Valentine's Day? Are you surprised Mario is so unloved in this poll? Tell us below. Waluigi representation in an award that screams desperation. Every Waluigi fan wants him to win even though his chances of joining the battle are so thin. As said by @GrailUK, Waluigi won for Valentine's Day, but as a fighter he's a little bit... out of a chance to join the fray. That last rhyme had to be changed, my poetry had to be rearranged. Nevermind all that, nevermind the rhyme, and enjoy this one last... Waluigi time. 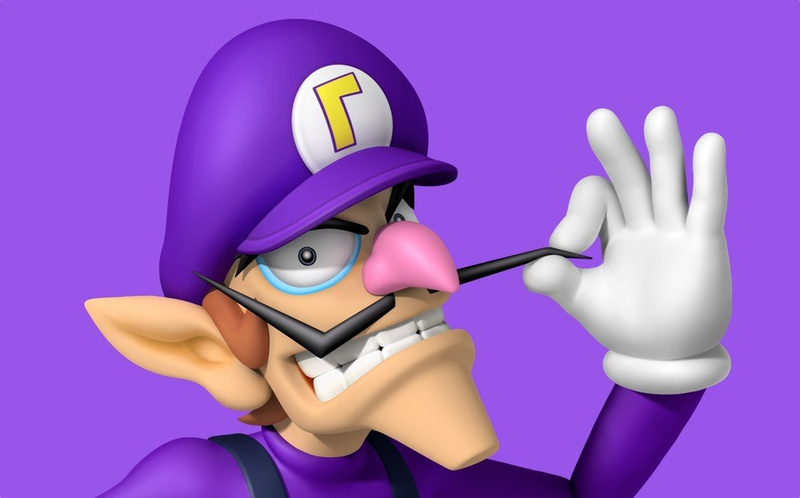 I dont care much about Waluigi and only joked about it, same with Shaggy but hot damn. In Nintendo forums people speak negatively about Waluigi but in every irl meeting ive ran into and in every single poll that got Waluigi on it, Waluigi is by far the most liked character. I wouldnt mind seeing him on Smash or future Mario games. Ill still pick Toad for my games but again, i wouldnt mind Waluigi. Id try him if he became playable but I would still main King Dedede. Atleast Waluigi looks more interesting than half of the Smash roster. It says something. Aslong as he got fans, Nintendo shouldnt ignore him imo. Same with Toad, some people dont like Toad but it shouldnt mean people should tell him not to be included in games. Listen to the fans id say. Waluigi won because he emits raw sexual energy like no other. Anyone who chose Isabelle needs to be banished. I don’t see Medusa as an option. How do I tell them I really want another Kid Icarus game? I mean... being romantically inclined in half of the competition seems... unhealthy? @nintendobynature ‘Boo’ is the correct response to that joke! To quote Palpatine, "I love democracy". Poor Mario. Also, I hope this isn't a subtle preview that Jibanyan will be one of the DLC characters in Smash. If there's no Waluigi, I can settle for Dampierre from Soul Calibur. I'm just waiting for the guy who's in love with Birdo to appear in the comment section. This are usually pretty easily manipulated. It's kinda like GameFAQs and their polls which have the same person voting for the result they want a few hundred times. Don't be sad, Mario... you're still my favorite character of all time! I wonder how many fake accounts they create just to get to that number. @JackEatsSparrows I agree. Even All-Mighty Idiots need love too! I remember back in 2017 that NintendoLife held a fanmade Smash Ballot for Smash 4, and the "winner" of the ballot was Krystal from Star Fox. But someone used bots from a single IP address to have her come out on top, and her real position on the ballot was much lower, somewhere around 20th to 25th place. As a fan of Krystal (she is my favorite video game character, after all), I humbly apologize for that on behalf of the Krystal fan community at large. @TheFanatic what about Kibry, Pikachu, and Jibanyan? they aren't humans. @Aozz101x At the end of the day, they’re all video game characters, so it’s weird anyway. It’s just Isabelle has a certain innocence to her character that is frequently tarnished by the Internet. Manipulating online polls by voting bots. That easy. Nobody should trust these polls. They are easy to cheat. @TheFanatic i see what you mean. and i agree. Good thing people don't do that during elections! @AJWolfTill "giving a valentine to" does not equal "want to be in a romantic relationship with". On Valentine's day, you can give tokens of gratitude to friends and people you appreciate. ...which sounds much better than what he actually is: lanky, pointy and gaunt. I am actually surprised people didn't equate this to how Waluigi doesn't even deserve to be in the vote because a specific two harassers of the internet during Smash. No Shy Guy makes me want to Die Guy. people who like waluigi are stupid. he's ugly and annoying. why on earth would you want to give a valentine to him, what a joke. also don't even think about making nintendo add him to smash because he doesn't have enough moves to be in the roster. We need a WALUIGI GAME!!! The fact people think Waluigi fans are trolling, or that it's "vote bots" is really sad. I understand people don't like Waluigi, but a lot of people do. He's one of the most underrepresented named characters in the mushroom kingdom, and if you actually have played as Waluigi in almost any game he IS present in, you'd see he's actually really unique and interesting. He's evolved past his "Just a partner for Wario" needs back in Mario Tennis, to an awkward doof you can't help but love! And yes, I sincerely like Waluigi as a character. This isn't some "troll" post. He's been my main in basically every game he's playable in. Much love for the underdog. @Azikira Him winning is one thing. That's not what makes his vote count questionable. What is making people wonder is by how much he is winning here. Even if we accept he has some popularity, it's doubtful he trails the entire Mario cast by THAT much. @Fokkos didn't you read what I said, waluigi doesn't deserve to be in smash because he doesn't has many moves as other characters. Gilgamesh may have been a fighter in Dissidia Duodecim, but Waluigi will always be an Assist Trophy. All we need is Sakurai telling us all that Waluigi is only gonna be an Assist Trophy, and this whole Waluigi obsession is just a dead meme, just like Bowsette! We don't need a fire-breathing Peach Lookalike as a final boss! We got Meowser! And besides, if Waluigi is gonna be a fighter, an update removing him as an Assist Trophy would be required, and we'd need a filler assist to take his place, like Resetti. Damn people still can't let go of Waluigi being nothing but a meme? @Regpuppy I can't claim to know if the numbers were altered, but I concede he could have won due to foul play. I mean, that's pretty in-character though you gotta admit! @Sandro89 Please tell me you're joking. What did I say that would make you think I wasn't being 100% sincere? I've been playing him as my main character since December of 2000 when Mario Party 3 came out. Have you ever played Mario Hoops 3-on-3? Waluigi is hilarious in that one! Mario Strikers Charged he was such a crass dude, it was so funny watching the victory chop! I don't know what I could say to convince you otherwise, but I guess at the end of the day I don't need to prove anything. My word is my word, you may choose to believe it or not. @Sandro89 do you honestly believe no one can actually like waluigi? He probably has more actual fans than the characters in our avatars combined. @YoshiAngemon That's easily doable, given that they've already done that in the past with Toon Link and Alfonso in the Spirit Tracks stage. Whenever someone is playing as Toon Link, Alfonso will be driving the train instead. Either they find another tall character to replace him (ie. Wiggler or any of the other playable characters from the Tennis games) or just replace him with a clone that looks like him (ie. use a robot from the first Strikers game, make an entirely new Waluigi bot, or simply use a Cosmic Clone that looks like him). It'd still take extra work though, so I'm not really sure whether they'd be willing to go through the trouble of doing all that. @Sandro89 That is false, their are REAL Waluigi fans out there. One is being my brother. Don't be close minded thinking it is just a meme. @andrew124 @AlexSora89 Guys, tone down your Waluigi hate! Noone wants to hear the same thing over and over again! @Azikira - Waluigi fan here as well. I mained him and DK in Double-Dash!! And year, Strikers Charged he was one of the more favorite ones to watch win. I want him to step out of the looming shadow of Mario spinoffs. I want to see him and Wario take a villain role in a Mario game. Or take a role in WarioWare. Goes to show, give the Internet an inch, they’ll take a mile, especially for a meme. Waluigi has a kind of absurdist, almost existentialist nature. All the other Mushroom Kingdom characters play sports as a break from their classical heroism, but Waluigi only has sports. He's a doubles tennis partner for Wario, who is himself the negation of Mario - third from the truth, as Plato might say. His existence is meaningless, worse than meaningless, a joke. He is stupider, weaker, and uglier than everybody else and has no meaning to his existence. However, he acts as if the one thing he was created to do, play sports, as if it is the most important thing one could ever do. If he wins, he is the superstar, the best, the hero. If he loses, it is anybody else's fault, for the world is out to get him, full of cheaters. He has no meaning, so he makes whatever sport or minigame he is playing to be his meaning. He honestly believes himself to be the superstar, because it is that or the abyss. His existence makes no sense. But he embraces the nonsense and creates his own reality out of it. We root for classical heroes like Mario and antiheroes like Luigi, but Waluigi is the absurd hero, and in him we see ourselves, responding with both love and horror, as one seeing oneself ought. Am I being sincere? Am I being tongue-in-cheek? Perhaps, like Waluigi, both. But what is true is that I have appreciated Waluigi from my youth, because he makes me laugh, and because he annoyed my little sister. Note that my little sister and I have played Smash Bros. together since we were kids and you'll have a plausible reason for why I'd buy Waluigi DLC in the blink of an eye. @Dodger By far the best comment here, and there were some good ones. But I'm probably a bit biased insofar as I've always sort of viewed Waluigi in virtually the same kind of light (or lack thereof). Moreover, your comment feels like something that I would type up after my morning coffee and adderall xr kick in. And that's some of the highest praise I can give. Ewww, but most likely troll votes by the Waluigi for smash crowd. Those statistics seem incredibly skewed as in some people likely voted multiple times from multiple accounts. Still Waluigi is loved by at least some of the most vocal of Smash fans, but I don't get it. @KyleHyde I was referring to reprogramming all together. If Waluigi were to be put in Smash Ultimate, then they would have to remove his assist trophy altogether, and replace the assist trophy with Mr. Resetti, ranting about the importance of NOT RESETTING! @Sandro89 I think you are the troller there mister. I like waluigi not because of memes and I met a lot of people who loves him for real, also you saying that waluigi is just a meme while you Ignore the facts there's "Yoshi'd tax fraud meme" and "DK'e expand dong meme" and don't forget Wario says "wah" too, that's means saying waluigi is just a meme like you saying Wario is just a meme. If the alter-ego of Mario is Wario, why isn't it Wuigi for Luigi? As you can see... Waluigi's name is quite appropriate, being literally a bad copy. It's not bashing the guy as much as it is about mocking the people so desperate about him. Who voted for this and why? Mine woulda been for Isabelle. She woulda made an adorable Valentine. @TheFanatic I see her more as a cute Valentine card for little kids. Complete with a cheesy, pun-based phrase on the card. You know, like the ones we got in elementary school with Care Bears or the Peanuts Gang or something. @Tempestryke Valentines Day Cards? I’m not familiar, I’m sure they got lost in the mail or something. I find it funny people these days are only now looking for any excuse they can to try to discredit the Waluigi fanbase. The stupid "he's a meme" statement that has ONLY ever been parroted after Smash Ultimate came out of nowhere and it makes me smile people think you're not allowed to like """"meme"""" characters when absolute jokes like Jigglypuff whom are factually far more unimportant to their own franchises and have even less credit to them aren't called out for it especially when Waluigi has plenty of genuine appeal to him: his cocky attitude backed up by the fact he's a top tier metagame threat in sports games pretty much making him an alpha whom can trash talk everyone else and claim to be better than them only because it's TRUE, the fact he has the absolute highest Jumping stat in Mario lore that makes him capable of jumping higher and better than Mario "Jumpman" himself, the fact his accentuated trait is usually his Skill or Technique that shows he doesn't rely on being faster or stronger than his opponents to beat them or barrel through them like Wario usually can but by outsmarting them via finesse, trickery and techskill. Even then, people can like a character for whatever reason they darn well please and making nonsensical statements about the character's ""meme status"" isn't going to change that. Also makes me happy that at least Jibanyan, a character I also like, wasn't as big a loser as Mario was. Apparently he is now at 1million votes??! @AlexSora89 Fair enough. I can understand that some Waluigi fans can be kind of toxic, making civilized fans like me look bad. Didn't mean to give you crap. Thing is, Waluigi needs more, er, smashable traits to get in Smash. I think the most moveset-able stuff you can find about Waluigi would come from Mario sports cutscenes, although I admit his special shot from Mario Hoops 3-on-3 would make for an excellent up-B. @AlexSora89 Didn't see you give me crap. I can admit Waluigi doesn't have much for a Smash moveset. Fair enough. I could easily see most of his sport moves becoming attacks, but then again, Peach and Daisy's side smashes kind of exist. Lol Waluigi is so handsome, the girls must love him!